Spain's Correos using Post and Go machine to boost philatelic sales. It's here! The next National Fair will, for the first time, have a label vending machine (ATM). In the same way as has the British Royal Mail, Correos has purchased this machine for events related to stamp collecting as fairs or exhibitions. The sale of franking postage labels is an element of philately offered in several nearby countries (France, Belgium, Portugal, Norway, United Kingdom). Correos stopped offering in these in 2006 when Epelsa withdrew the machines. With the aim of boosting the philatelic market and to once again offer collectors and customers labels issued through a self-service philatelic kiosk by card payment, Correos has acquired one of these machines for use in specific events (collecting fairs, exhibitions etc.) and also so that they can place orders for labels outside these events. The model acquired by Correos is the same as used by Royal Mail and installed in various philatelic exhibitions in England and those abroad in which it has participated. It has also installed several permanent units in some museums in the country: in the British Postal Museum and Archive, the National Museum of the Royal Navy and the Royal Marines Museum. This equipment already present in numerous fairs abroad, have been a revolution in the world of stamp collecting with very innovative and attractive profits for collectors as they allow temporary special issues that can be adapted easily to the event or location and tariffs also customizable. The labels will expend the ATM machine printed with a special ink that, unlike the old machines EPELSA, remains indelible for a minimum period of ten years. So for 2016 the two designs of the Plaza Mayor Square scheduled for the National Stamp Fair will complement two other related products / postal and telegraphic elements designs. They commemorate the 300th Anniversary of the Post. 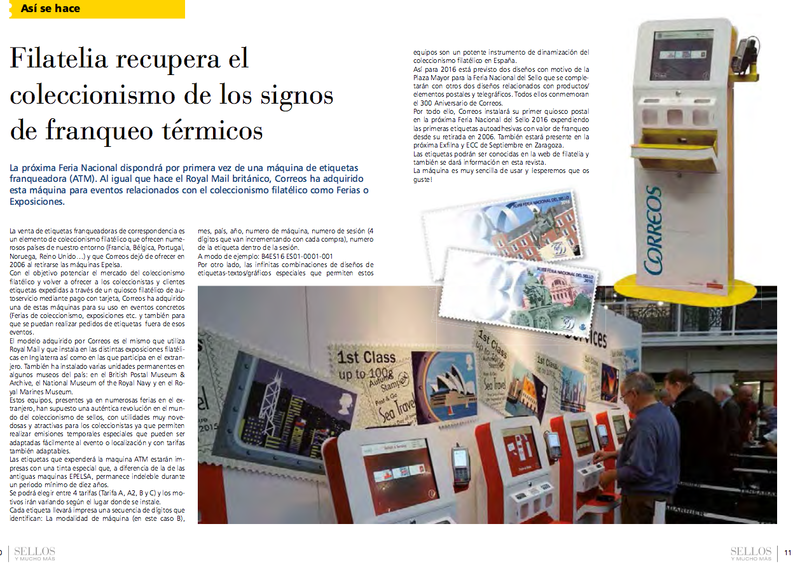 Therefore, Correos will install its first postal kiosk in the next National Stamp Fair 2016 expending the first self-adhesive labels with postage value since its withdrawal in 2006. It will also be present at the next ECC Exfilna and September in Zaragoza. The machine is simple to use and lets hope you like it! In order to resume this service, Correos has acquired a "FILATÉLICO POINT" thermal label dispenser, self-adhesive paper and postage to mark up the rates A, A2, B and C.
This "FILATÉLICO POINT" will be installed for the first time at the upcoming National Stamp Fair 2016 to be held in Madrid from 21 to 24 April. The machine allows a maximum purchase of €399.99 per session and only accepts credit card payment. On 21-22 April two stamp designs related to the National Stamp Fair will be sold, and on 23-24 April two other designs. After the fair, the machine will be located in the lobby of the CCP Chamartin Branch Post Office* (Calle Hiedra, 7, 28036 Madrid) and can be used as self by the general public. The "FILATÉLICO POINT" will also be taken to Zaragoza where it will be installed as part of the Exfilna / ECC which will take place from 14 to 18 September. On this occasion, two new designs of stamps will be issued. The other two stamps will be sold by self-service in the CCP Chamartin also being able to make your purchase order by the Customer Service Philatelic for orders above 200 € amount. Well, at least Correos is being openly honest that the primary purpose of these machines is initially philatelic rather than operational. Readers will recall that Royal Mail's first machine (in Bristol) was operational, rather than philatelic, and whilst many machines have been installed in Post Offices, that programme seems to have reached its limit, and further expansion is purely philatelic rather than operational (with the exception of M001 at BFPO Northolt). Whilst sales of the machines to other postal authorities (Jersey, Guernsey, Gibraltar, Qatar and now Spain) can only help Royal Mail's bottom line, it would be nice if some of the authorities were looking at operational use in post office branches as a primary function, rather than secondary. The BPMA had problems over the past few day so new varities, the same but less so. Problems with Mail Centre / Delivery machines + all museums having a new stamp Euro (blank no weight) Worldwide 10g. I do not think many people would have noticed or gone to any machines when they would be paying what would be 7p more each strip. What has this to do with a Spanish Machine ? Although there is a connection. These machines are made by the same company. Are these errors deliberate or down to incompetence ?